Since 2010 agricultural holdings functioning in all the EU Member States are classified according to the amended rules of a Community Typology for Agricultural Holdings (CTAH). Essential modification of CTAH was the replacement of Standard Gross Margin (SGM) parameter by the Standard Output (SO) parameter. introduction of an additional „classification” reflecting the importance of the other gainful activities directly related to the holding (OGA). The necessity of typology modifications came into being after decoupling of direct payments. Therefore, SGM coefficients without subsidies were negative for some agricultural activities, because value of production at market prices did not cover value of specific costs incurred. Moreover, changes in typology were also made in order to simplify the rules. The change of coefficients for particular crop and livestock activities has an impact on two classification criteria: economic size and type of farming of an agricultural holding. The extent and trend of these changes are determined by the fact, that in SO coefficients calculations no direct payments and no specific costs are taken into account. Standard Output is the average monetary value of the agricultural output of an agricultural product (crop or livestock) over the reference period of 5 years, calculated per 1 agricultural or calendar year, per 1 ha or 1 head (exceptions: mushrooms – per 100 m2, poultry – per 100 heads, bees – per 1 beehive i.e. 1 bee family), in average production conditions in particular geographical units (regions). In order to enable the analyses of time-intervals – in spite of essential changes in CTAH – each Member State was obliged to calculate „temporary” regional set of SO „2004” coefficients over the 3-yearly reference period 2003-2005. Thanks to it, it is possible to prepare classifications of agricultural holdings in parallel according to old and new rules of CTAH. 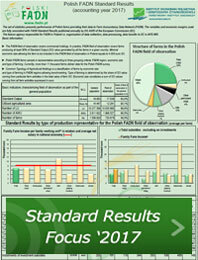 Set of SO “2004” has been used in terms of selection plan of farms for Polish FADN in accounting years 2010-2012. SO „2013” (reference period 2011-2015) – the latest set of SO coefficients has been transmitted to Eurostat in December 2016. Standard Output (SO) coefficients of Member States… (after you choose the wanted country/flag, the Excel file will be downloaded, where one of the spreadsheets includes SO coefficients). for SO “2013”: 4,17347 PLN. Type of farming is characterized by the relative contribution of different groups of agricultural activities to the holding’s total SO. For the purposes of analyses and publications in the framework of Polish FADN, simplified structure is applied: TF8-types of farming as well as ES6-economic size classes. Methodological manual RICC 1500 rev. 3 Typology Handbook. Since 2015, the legal provisions on Community Typology for Agricultural Holdings have been integrated together with the FADN legislation. Commission Regulation (EC) No 1242/2008 has been repealed by Commission Delegated Regulation (EU) No 1198/2014 of 1 August 2014 supplementing Council Regulation (EC) No 1217/2009 of 30 November 2009 setting up a network for the collection of accountancy data on the incomes and business operation of agricultural holdings in the European Community. Methodological manual RI/CC 1500 rev. 4 Typology Handbook.